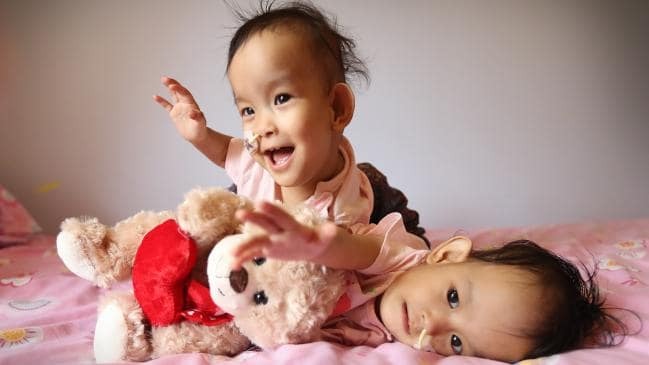 Doctors have successfully separated the 15-month-old conjoined twins Nima and Dawa Pelden. They have been joined at the torso and sharing a liver and grown facing each other. The girls could not sit down together and could only stand one at the same time. The girls were discovered not to share a bowel which was something the surgeons didn’t know before the operation. Lead surgeon Dr Joe Crameri told reporters the girls had coped “very well” with the six-hour operation and said it was a “joy” to tell their mother, Bhumchu Zangmo, about the success of the operation. Last month, the twins were brought to Melbourne from Bhutan together with their mother by Children First Foundation, an Australian-based charity. However the surgery was delayed until Friday, Nov. 9, to improve the their nutrition needs. Two teams one for each girl and around 18 specialists were part of the operation at the Royal Children’s Hospital in Melbourne. The girls are expected to return home after they have fully recovered.